This is my friend playing with me. She calls me 'bata' which is Tagalog for child. I was so sleepy I could not stay awake during the drive home. Mom and her friends took me to the beach this weekend. We went to Monterey and Carmel. It was so nice there and the weather was cool which was great for me. Not so great for Mom and her friends. They like the warm weather. 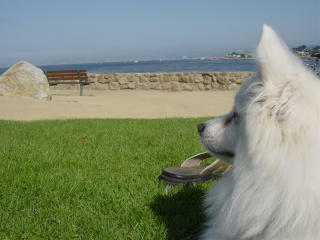 We had a picnic at a park and went down to the beach in front of Cannery Row. I saw lots and lots of doggies and I chased a lot of birds. I even climbed a bunch of rocks to get a better view of the ocean. A man said he saw another American Eskimo walking along Cannery Row but we did not see him. After walking around Monterey, we went on the 17-mile drive. I fell asleep during the drive from Monterey to the entrance of the 17-mile drive coz it was my naptime already. I woke up when I heard the sound of the man at the ticket booth. The view was really nice! We saw the Lone Cypress and a bunch of Ghost Trees. We stopped at one of the beaches coz I farted and stunk up the car. So Mom said it was about time I went for a poop while they aired out the car. After that, we went to Carmel. Carmel is a really dog friendly place. I saw lots of doggies there, too. And they have lots of restaurants that allow dogs in their patio area. I saw a German Shepherd, a Labrador and 2 Keeshonds at the restaurant we ate at. The 2 Keeshonds were just 6 month old puppies but they were already bigger than me. 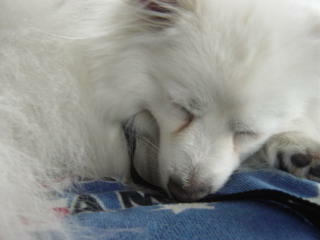 I was so tired from my long day out that I slept in the car all the way home. 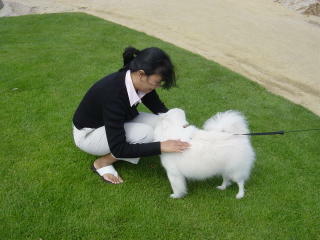 Mom was able to get in touch with other Eskie owners in the San Francisco Bay Area yesterday. Yey! We finally found some Eskies nearby. We were beginning to think there weren't any. They think it would be a great idea to have an Eskie reunion here like the one they saw on this yahoo group posting (3rd Annual Eskie Reunion in St. Charles, IA). They had a lot of Eskies at that reunion plus other doggies, too. There is even an American Eskimo there named Casper just like me. He has some really funny poses. 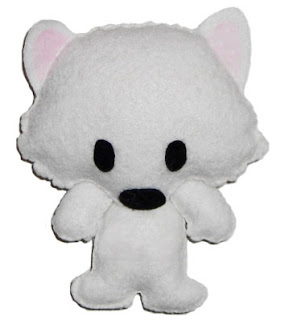 He even has a comic strip called Pesty the Eskie. We took a look and it was really funny. The ladies that contacted Mom have multiple Eskies. Lucky them! Mom wants to get me a playmate but since she is a novice dog owner, she does not think she is ready to get another doggie right now. We went to the Drigon Dog Park in Union City, CA. It was a really nice dog park. They had a section for small dogs and a section for big dogs. It was very clean with lots of grass. There were lots of fake fire hydrants around, too! There were also lots of stuff for agility training. Unfortunately, I do not know how to use those. 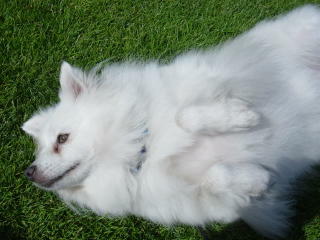 After checking out the perimeter, I was quite content to run around with the other doggies. A boy played fetch with me. It was a bit hot so after a while I would go under a tree to rest in the shade. Once I cooled off, I would go running around again. The people there were laughing when I would hide in the shade. 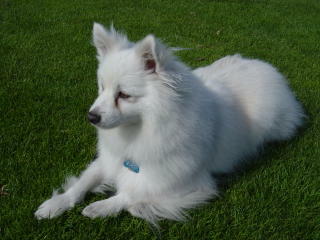 I was the only doggie there with lots of fur so I was the only one hiding from the sun. Mommie has decided to only take me to the dog park in the evenings from now on so it will be cooler for me. There were lots of other doggies there. There was a dalmation that was being really naughty. He pooped and his master did not pick it up. Then he stole a ziplock bag full of dog treats that belonged to some one else. And then he took a frisbee and would not give it back. The lady who owned the frisbee eventually had to leave it behind because he would not give it up. We went to the pet store today. While we were in line, a nice man gave me a pupperoni stick while Mommie was not watching. I took it from him and put in on the floor. I was not sure if it was ok to eat it. Eventually, Mommie saw the food on the floor and the man told her he gave it to me. He was a little hurt that I did not eat the pupperoni stick. So Mommie told me it was ok to eat it. So I ate it and turns out it was really yummy. The man gave me another one when I was done. I really like this guy. Hehe! Next time we are at the pet store, I will just sit and smile at people so they will give me treats. Mommie said I was a good doggie for not eating it without her checking first. One should not blindly take treats from a stranger. My entire undercoat is gone and I only shed a few strands of my topcoat these days. That is why Mommie lets me go to the carpeted areas now. Plus she opened up the sofa bed downstairs and put a bed sheet on it so I can go up on the sofa bed. I like it there. I get to watch tv from up there and I was able to discover that Mom had a pet fish on one of the side tables in the living room. I really like the fish. I spend a lot of time watching it swimming around in its bowl. It looked dead the other day. It was already floating on its belly. But for some reason it is alive again today and swimming around normally. The other night was the 4th of July. At bedtime I heard a lot of really loud firecrackers. There were 5 loud bangs outside the house. I was so scared so I ran up and stood outside Mommie's room. She was facing the door so she saw me there immediately. She let me know that it was ok and closed all the windows so that I would not hear anything from outside anymore. After she reassured me, she escorted me back downstairs. A few minutes after she went back up, I felt like going out to pee so I ran back upstairs. She was already asleep so I barked to wake her up. She thought I was still afraid of the firecrackers. So I ran downstairs to the door so that she would let me out. Good thing she got the message. I was so ready to go and I did not want to hold it until morning time.